Ferat Sahin, a professor of electrical engineering, is working to create robots that can make autonomous decisions. Ferat Sahin envisions the day when robots will work alongside humans on manufacturing lines, able to sense their surroundings and adapt independently to different responsibilities. Currently, manufacturing lines are single- processes—one robot performing one task. When a robot is disrupted by an object or a person, it is programmed to stop, halting production until the object is removed and the system is restored. Robots need to be re-programmed to learn new tasks. 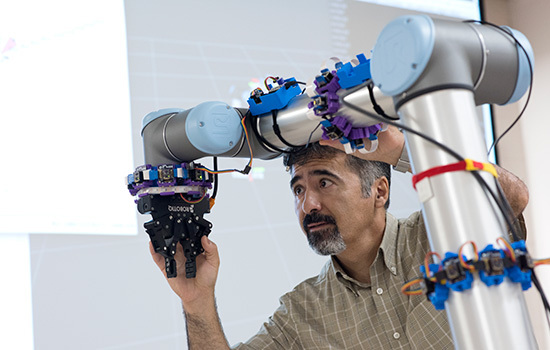 Sahin, co-lead of the robotics pillar of the Center for Human-Aware Artificial Intelligence, is working to embed more flexibility and autonomy into the robot’s system by integrating multiple biosensors toward what he calls collaborative robots—where the robots recognize objects nearby and can make autonomous decisions about actions. The robotics systems he is building have a dynamic safety index—information based on distance, velocity and acceleration of both the robot and the object or person—which meet manufacturing safety standards. It also integrates human signals and an understanding of meaning. Different emotions—stress, fear, anxiety, excitement—can be detected through behavior and biological signals that his team is collecting through markers, such as heart rate and skin changes. These data points can be read and interpreted by the robot then acted upon. Biological signal processing is a strength of RIT’s electrical engineering program. “Without robots being human-aware, it presents a risk, no matter how ‘smart’ they are,” he said.